China International Petroleum & Petrochemical Technology and Equipment Exhibition (CIPPE) is an annual gathering of petroleum and petrochemical industry. With a magnificent exhibition space of around 90,000 square meter, 18 national pavilions, 1,800 exhibitors and over 110,000 professional visitors from 65 countries and regions. CIPPE has become the largest petroleum exhibition in the world. GN Solids Control LTD advantage is we are the solids control manufacture that made the whole solids control machinery our-self plus we custom made the whole mud recycle system to meet specific project’s need for our customers. Our customer are ensure we provide the solids control machinery to meet local environmental standard around the world and dealing with manufacture them self to ensure the best possible price to keep overall cost of rig operation as consist as possible. We provide consist stocks of parts and tech personals ready at the request of customers by moment’s notice. There are lots of manufactures in China who can make less-costly machinery and system but adding other facts for operation consideration, GN Solids Control LTD is the choice of obvious. GN Solids Control LTD will exhibit replacement brands shale shaker screen, decanter centrifuge, complete mud system, shale shaker and various pumps. GN Solids Control LTD manufacture full lines of solids control machineries and its replacement shale shaker screen for itself and major brands. . We offer full lines of shale shaker screens in composite frame that will be acid resist and last longer than steel frame screen in house to become single supply source of drilling operation. Also welcome to visit us in the exhibitions below. This location is very close to Beijing airport, also GN factory. Welcome to visit GN yard in this time, or after the exhibition. FHD decanter centrifuge, full hydraulic is an absent product for quite a long time, as there is no such products in China can be equal to the US / EU products. And lots of clients feedback to us that the hydraulic system from China is not so good. So for FHD centrifuge, the first thing you need to find is hydraulic gearbox. Though this is not the only option, as some clients are using hydaulic motor, without gearbox running the centrifuge, whist the site is different, the motor they do not find from China either. So as we did to the shale shaker, find a good shaker motor; we choose to source the same hydraulic gearbox as Rottadiff, we set a same starting point as US / EU products. Lots of suppliers are considering all the bowl bigger than 14in as big bowl centrifuge, this time we bring some real challanged products. 30in bowl, with ratio upto 4.2, which is our model GNLW764. Lots of other improvment, too. Welcome to visit us in our booth in either exhibition. GN Solids Control have joined many exhibitions in 2016, and met with clients from all over the world, if you are not one of them yet. Here is somethign you will not miss in future. Time: 29 Nov. ~2 Dec.
Then you have probably already missed CIPPE, OTC, ADIPEC, Trenchless Asia, Iran Oil Show, Russia oil show etc. Using our equipment, or not yet, you may want to know what we have done, the R&D. Well if you have kept tune with GN news, or following my linkedin, then you may have already noted all this. 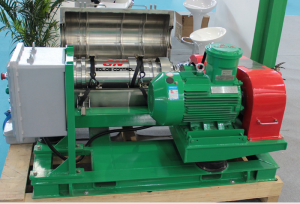 This year, GN have released decanter centrifuges for all other industries, food, waste oil, farming etc. Now GN can manufactur most of the popular screens with composite material frame, which tested in Russia, operating time is more than 500hours. 2) Who is your client, who have used your euqipment. If you have download our presentation, you may noticed we list some of them. Baker Hughes, the case study can be found here. We will let you know what we normally did, with your comments, we will find the solution for you. Follow George from Linkedin, get more recent updates. GN is joining the Petro India exhibition in New Delhi, from the very start, GN have done very good in India market, thanks to all the support from clients there, we keep growing up our business. Though the market is not going very well, still we get a lot of potential there. This time we will bring a small centrifuge GNLW223 and some shaker screens. With updated model, a small sparrow showing the whole picture of the birds. With duplex SS bowl, tungstun carbide tiles screw protection, ceramic ring protection for solids discharge. Welcome to visit our booth and have more information there.